Heat the oil in a large heavy based saucepan, then add the popcorn. Cover with a lid and listen for the sound of popping. Shake the pan occasionally and remove from the heat once the popping subsides. Toss in your choice of flavours (see ideas below in cooking tips) and serve immediately. 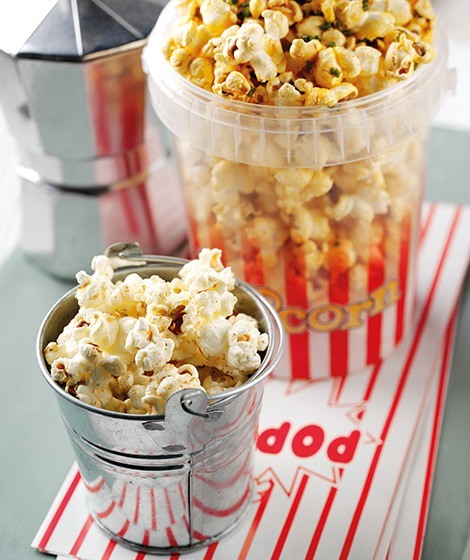 Enjoy your popcorn plain, try the below delicious popcorn flavours - or why not invent your own popcorn recipe. Note: the Nutrition Per Serving info above includes the ingredients for the below 'Honey & Mixed Spice' recipe. Maple Syrup & Cinnamon: 2 tbsp maple syrup, ½ tsp ground cinnamon. Gently warm the syrup and cinnamon and mix into the cooked popcorn. Spicy Paprika & Chive: 1 tbsp rapeseed oil, ¼ tsp hot smoked paprika, 1 tbsp finely chopped chives. Mix the oil, paprika and chives together and toss into the cooked popcorn, season to taste with a light sprinkle of salt. For a less spicy version, use sweet smoked paprika instead of hot. Try using Cajun seasoning for a variation. Smokey: smoked paprika, cayenne pepper and a pinch of salt. Curried: ground coriander, cumin and turmeric - add chilli for heat. Barbecue: sweet paprika, a little dark brown sugar and a pinch of salt. Mexican: chilli powder, ground cumin and onion powder. Italian: very finely grated hard cheese (e.g. Parmesan) and dried oregano. Herby: grind together dried herbs such as rosemary with a pinch of rock salt. Sticky: stir in a couple of tablespoons of maple syrup or honey. Cinnamon: mix a little ground cinnamon with a touch of golden caster sugar. * Look out for ready-blended spice mixes such as Cajun, Creole, Garam Masala, Ras el hanout, Thai 5-spice mixes - or raid the store cupboard and try making your own creative blends. * Cooking with children can be an enjoyable way to help them learn about food and nothing beats the 'popping' of popcorn and then eating this Whole Grain treat straight away.